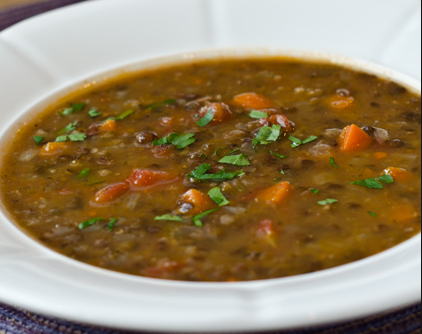 1) Rinse and drain lentils, cover with salt and boiling water, let sit while you begin toasting the spices. 2) Heat heavy bottom pan (I use a Dutch oven) to medium heat. Add cumin, turmeric, smoked paprika and toast until fragrant, about 3 or 4 minutes, stirring. 3) Add butter, stir. Add onions, celery; sauté’ until translucent. Add ginger and garlic and stir until fragrant. Do not let burn! 4) Add bay leaves, thyme and sauté’ briefly. Now drain lentils and add to pot with beef stock. Simmer about half an hour, until lentil;s are cooked. Stir in ketchup, simmer another few minutes. Adjust seasonings.